I know it must be hidden somewhere in this thread but cannot find it for the life of me. Please post some pictures of your "lightweight" toolkit for the 500 - what tyre levers and other bits do you carry with? As for the toolkit, don't forget that T45 torx bit. The usual spanners, 8, 10, 12, 13,17 and then spanners to take your wheel nuts loose, those double ended jobbies, I made mine welding 2 cheap Midas spanners together. On longer remote trips which might include some tar sections mousses might not be the answer though. Have them lubed before the trip and try keep your speed to 100. You can also stop periodically and feel how hot your tyres are getting, remember it is only heat that destroys them. If you are going to bomb along at 150 on tar...well then rethink. Ja keep the tar and speed down - look at the liaison distances they do with mousses at the Dakar and then go racing. Admittedly they are changing mousses daily. The Nitro mousse is very tough. The new KTM tools have a great combo spanner that has both wheel nut spanners and a small tyre lever in one. Some include a rear suspension hook spanner as well. Hi Dwerg, yeah. Your question has been on my mind the last few days. A 350 EXC... my first impression is its super light and quite a handful as a result. You can tell its designed for racing enduro's against 2-strokes. I am really enjoying this bike. In technical its much easier to manage than any 450 or bigger bike. Bear in mind though this is also my first EFi bike too. She lacks a little bit of grunt in the low rpm's but its not too much of an issue (I am 96kg after all!) and she lacks top end speed with the standard gearing. I think if you put longer gearing on it would fly, but you would need to slip the clutch a lot more in 1st, especially in a gnarly uphill. Definitely not a 450 but a very nice alternative to a 250 (if that makes sense). I would imagine that for long dirt roads it is not really the bike, as the new 450's are super light as well. But you are comparing against a 500? I would say this bike is the one to go for if you are going to be riding more technical trips; I would not recommend this bike for dirt highways - I think the engine would cook. The 450 & 500 have more momentum behind them, this bike feels more like a two stroke and I was missing the weight a little bit to be frank - probably just my bad technique. For what I am riding around here at the moment, I think it may the perfect bike: Distances up to about 300km, jungle & mountain terrain, rocky riverbeds, steep gnarly hill climbs, descents and horse trails. Much slower stuff to the rally type riding I am more used to. Quote from: KarooKid on Yesterday at 06:17:24 pm>I know it must be hidden somewhere in this thread but cannot find it for the life of me. Thanks Chris - will pop in over the weekend. 8 punctures in the field gives you experience. Why not carry the combination spanner and tyre lever units? Is it better to have dedicated tools than the combination tool? Tell us more about this socket set. The ratchet looks nice and compact. Where do you get it? Cost? What is the extender on the right? I used those blue handled tyre levers on a friends bike this past weekend - they really are excellent for small levers and that spoon shape works a treat and safest on tubes. A pair of those plus the one on the end of the KTM combo wheel spanner was all I needed. Bead breaker? ... well use a side stand if necessary. I am referring to these levers. You can carry one tool less then. Beware of the KTM 17/19/27/32 tool. If the tool or nut is slightly worn it just slips off. Been there done that and couldn't get a rear wheel off. 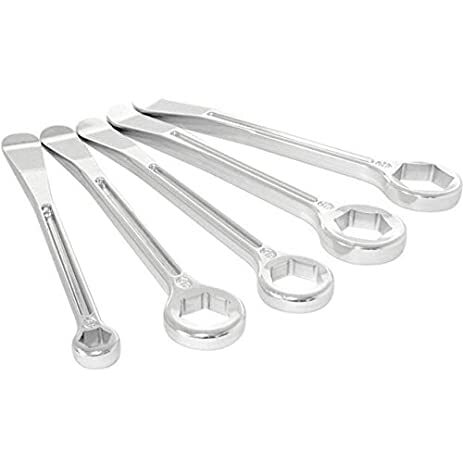 Best option are tire levers with dedicated spanner ends.